Discover Friends and Family Card ready for Summer! The July, August and September version of Discover Sycamore’s friends of family card is ready for use! We hope you are all taking advantage of these AWESOME discounts! Don’t have a Discover Friends and Family card? 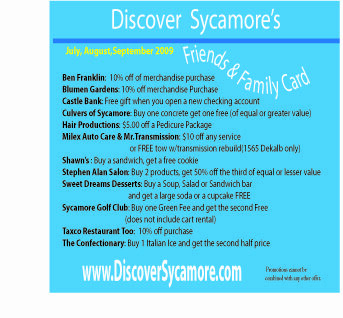 A quick look at the amazing discounts offered by our Discover Sycamore members will show what a great investment these cards really are! With frequent use, these card will surely pay for themselves in no time! Pick up your card at the Sycamore Chamber office today!